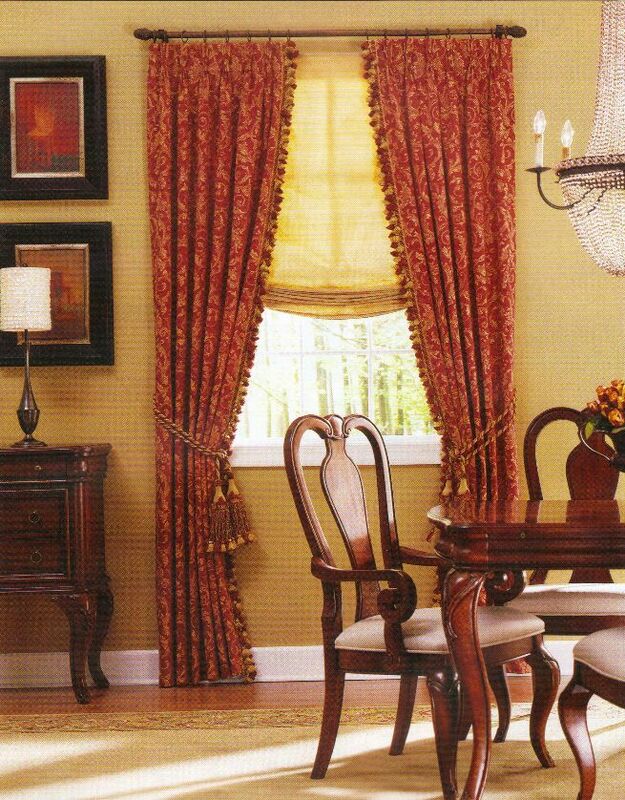 Our custom drapes panels add both design elements and color coordination to existing window treatments. With our panels, drapery fabrics and trimmings can be paired together and placed beside existing hard treatments for a soft approach. Banding and trimming accessories can also be applied to accent the colors within a room setting and add fashion to wood blinds and shutters. 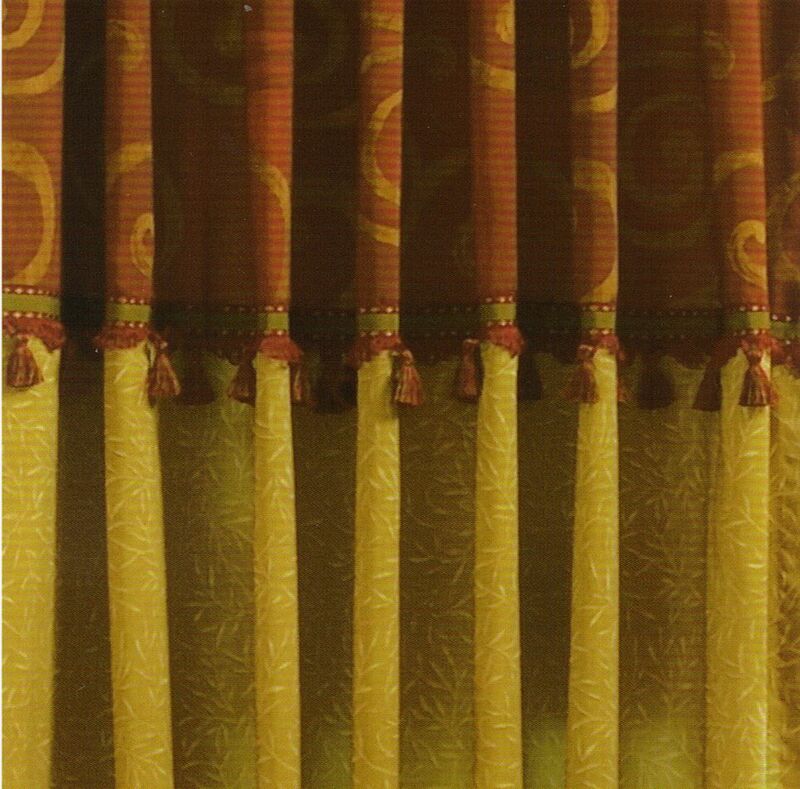 Challis: Pleated Panel Design This pleated panel design adds vibrant dimension to hard window blinds. Crisp, clean pleats accentuate the top of this adaptable drapery. 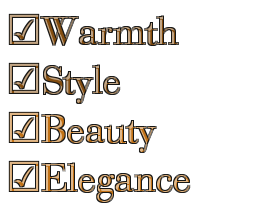 There are several pleat options to choose from. Note that you can even loop trimming cord around the top as shown, or add banding to blinds for a creative twist. 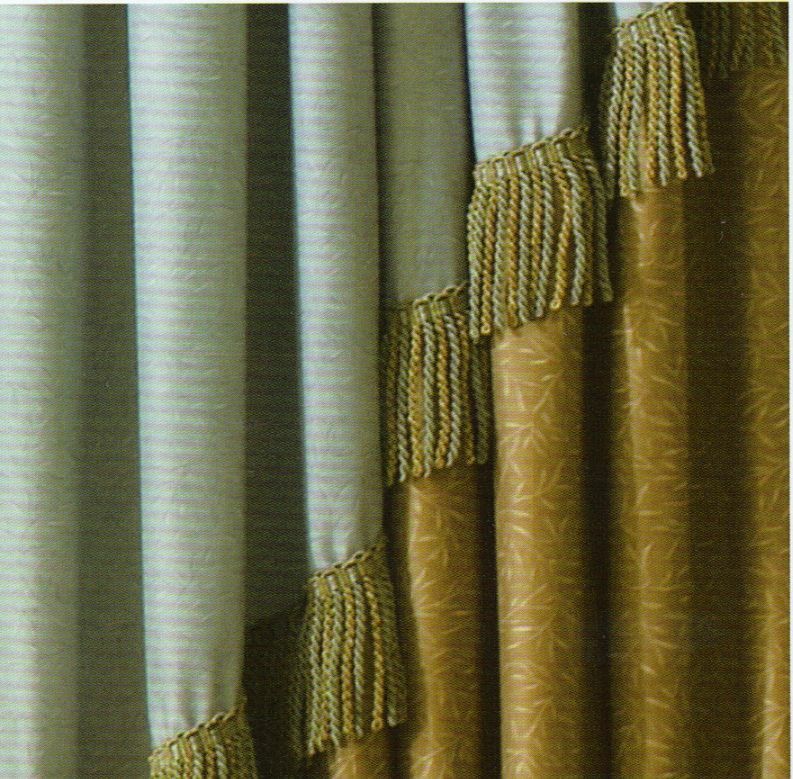 Cambria: Pleated Panel Design This classic panel design features an array of custom pleat options with a playful bell swag. Trimming is added to accent color, as shown here with bullion fringe on swag edging. 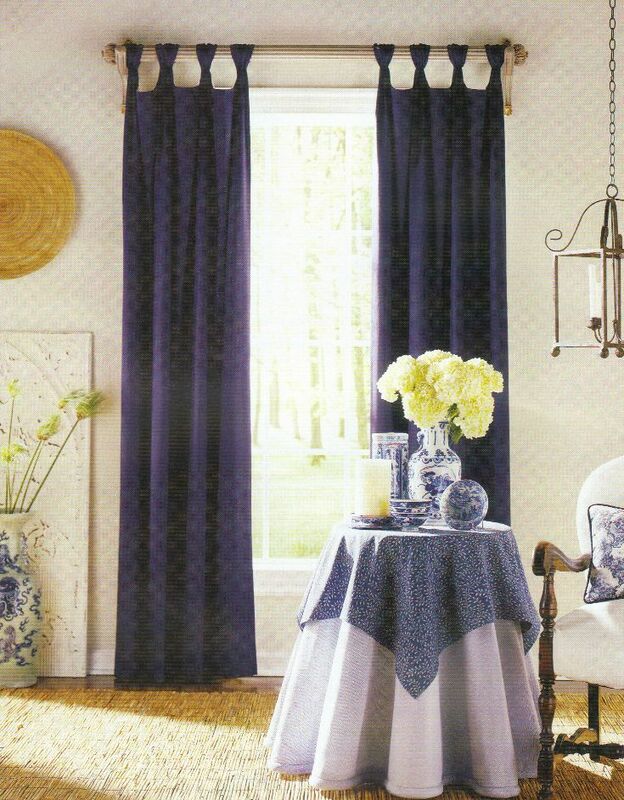 The choice of fabrics and trimming will also determine the overall décor setting that is chosen for the room. 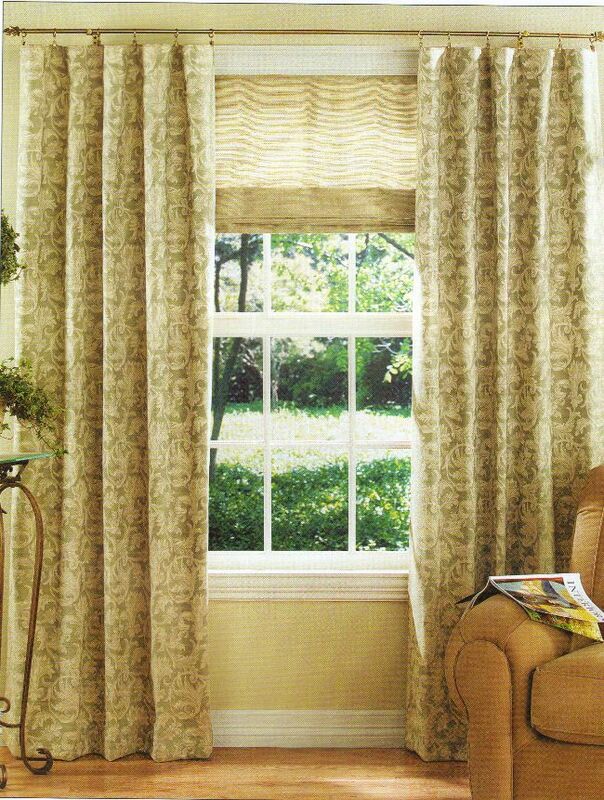 Fairmont: Pleated Panel Design Romantic design option offering a variety of pleats, this panel gives a subtle, uniform look to any window. 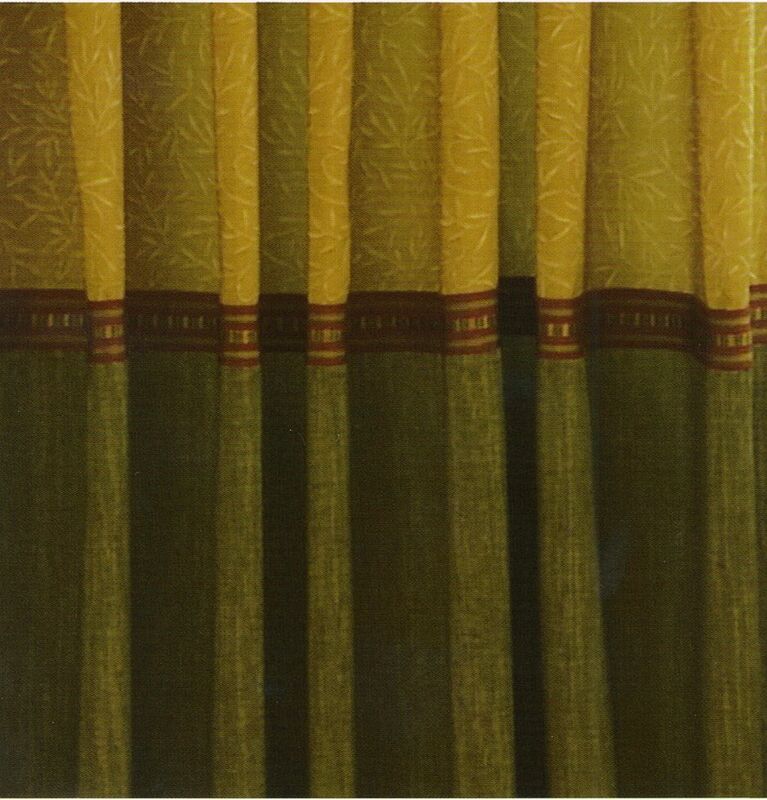 Notice how the design of the drapery panel is less curvy with more modern edges, while still adding softness to the window with trimming and colorful printed fabrics. 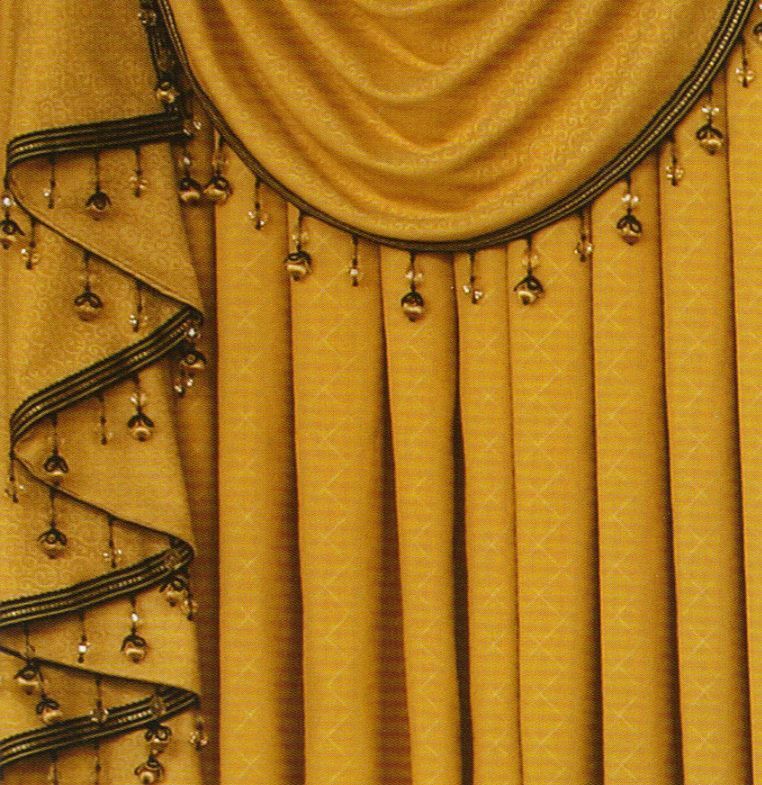 Quincy: Pleated Panel Design For traditional room settings, this intricate panel with swag design allows for creative fabric pairings and trimming embellishments. 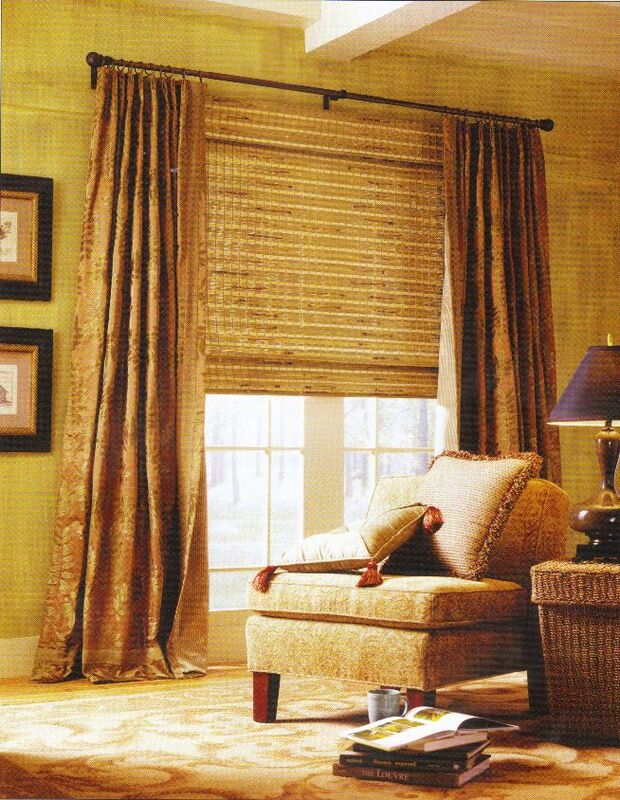 The swag additions bring depth to this pleated panel design and add flair to the entire window treatment – also a great addition to hard shutters or blind treatments. Jasper: Flat Panel Design Clean, modern lines paired witht hard blinds, shutters or soft shades – that’s what this flat panel design offers. 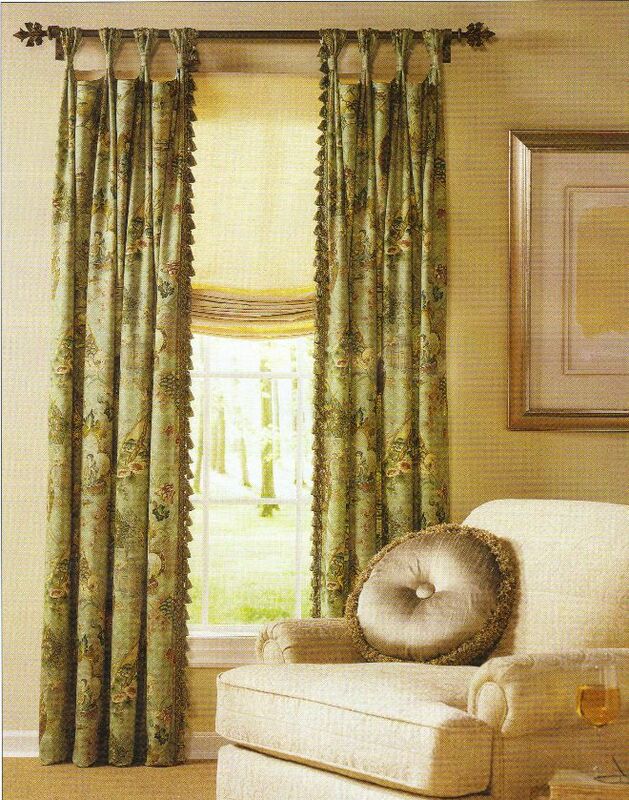 When a room calls for a contemporary treatment, printed fabrics in vibrant colors, sheers or drapery weight fabrics can be hung on rods or shirred for an aesthetically pleasing look. Bradford: Specialty Panel Design This unique panel showcases a fun diagonal design, which allows for a few fabrics and trimmings of various colors to be used in rooms that require some contrast. To make it more interesting, trimmings, shirred rods, or grommets can be applied to this design. It also pairs well with vertical blinds and sheers. Hartford: Specialty Panel Design If color is a main concern in the room design, this is a panel that allows for utmost creativity. 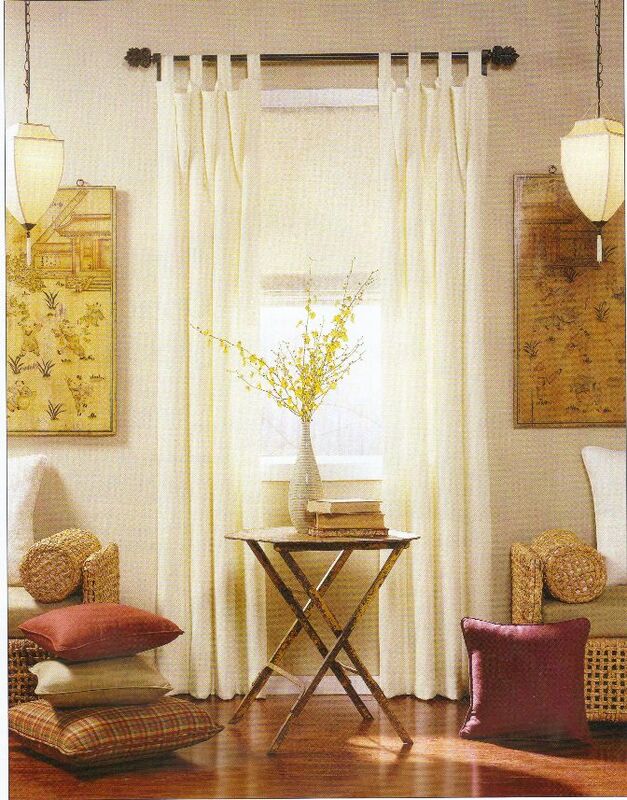 Featuring a horizontal window treatment design whereby various fabric combinations, different textures, colors, prints, and coordinated trimming can be used, meaning every color within an interior setting can be pulled into the treatment in order to hone in on the room’s main focus. This is also an ideal treatment for extra long windows. Contessa Panels Our Contessa panel style has no pleating. These are flat panels designed to be used with ring applications. 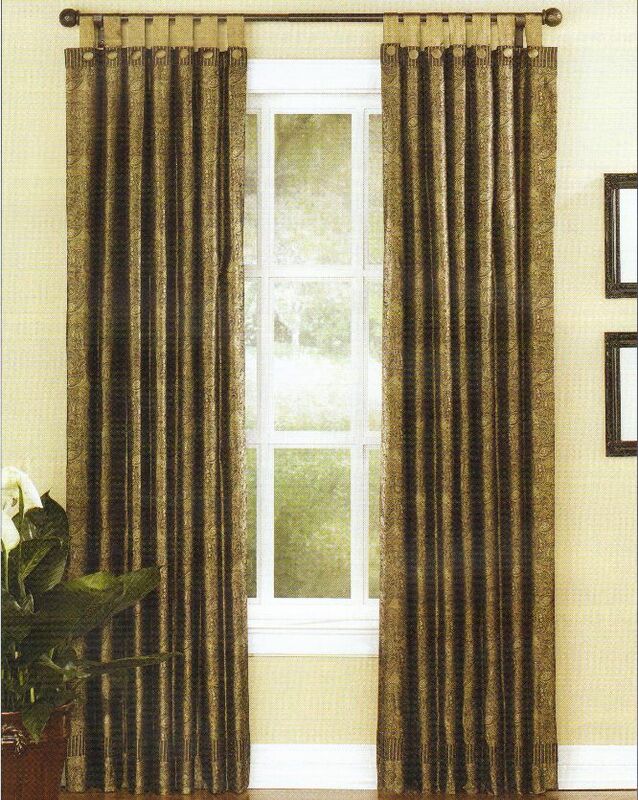 Each panel has a 16” overlay valance that hangs on the front of the panel. 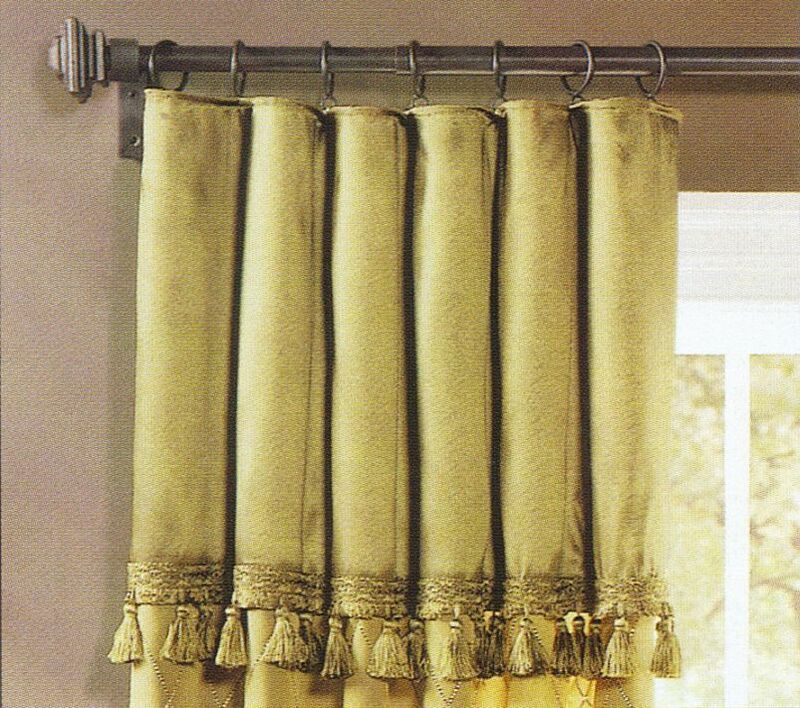 The valance provides visual interest and depth. It may be ordered in a contrast fabric for a surcharge. Contessa panels can be drawn together for privacy, or left as stationary decorative accents. Combined with the proper drapery hardware, they create a rather unique fashion statement. 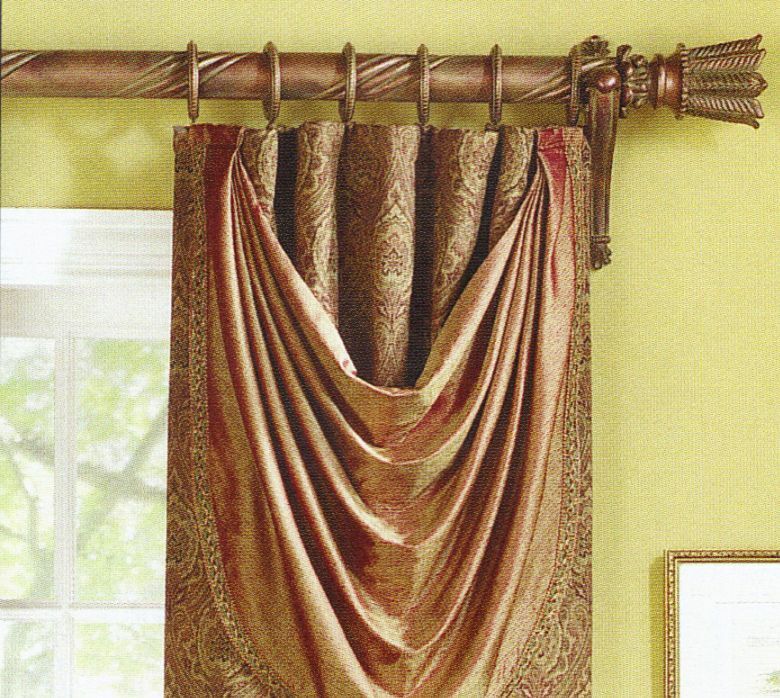 Hapsburg Drapery Panels These decorative panels feature a sculpted 4” tab appearance. They are sewn to create a shirred “tuck” in each. 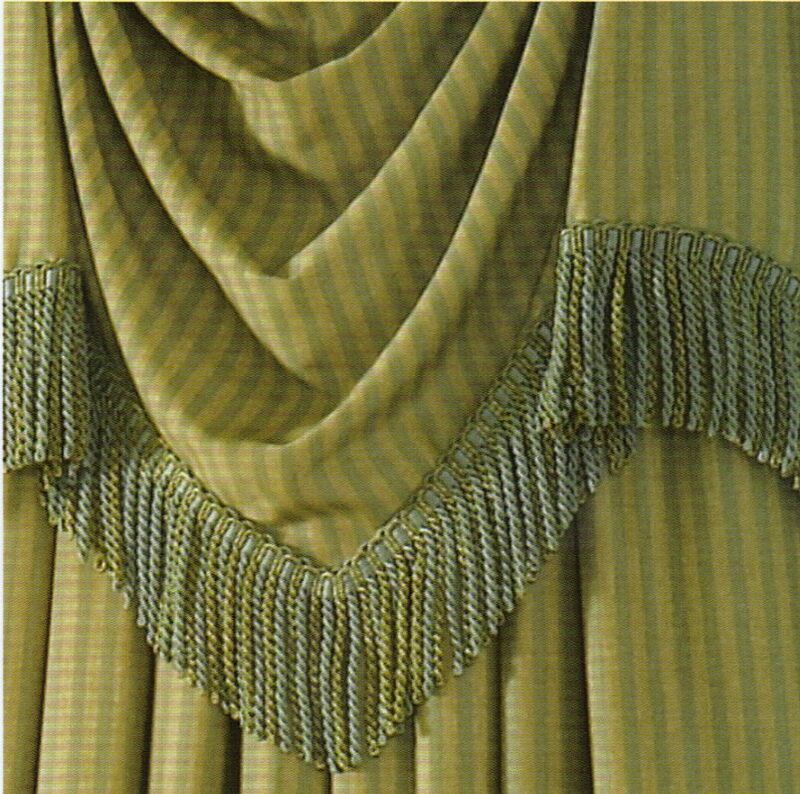 The top of the drapery is also sculpted to accent the soft curves of the heading (See the close-up image). The Hapsburg is a stationary side panel, designed to be mounted on a 1” or 1 3/8” diameter rod to allow the heading to create its effect. 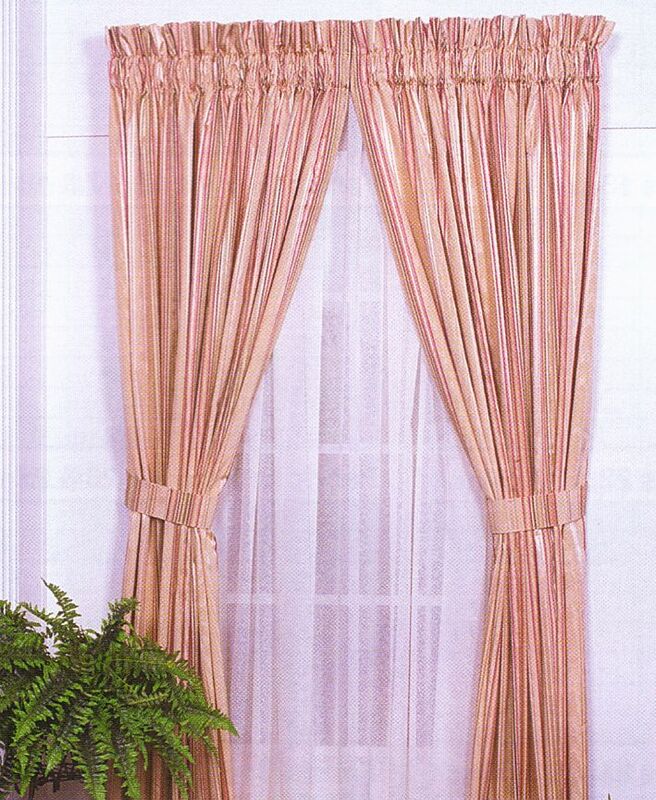 Lancaster Drapery Panels This style is pleated in the traditional French Pleat method. 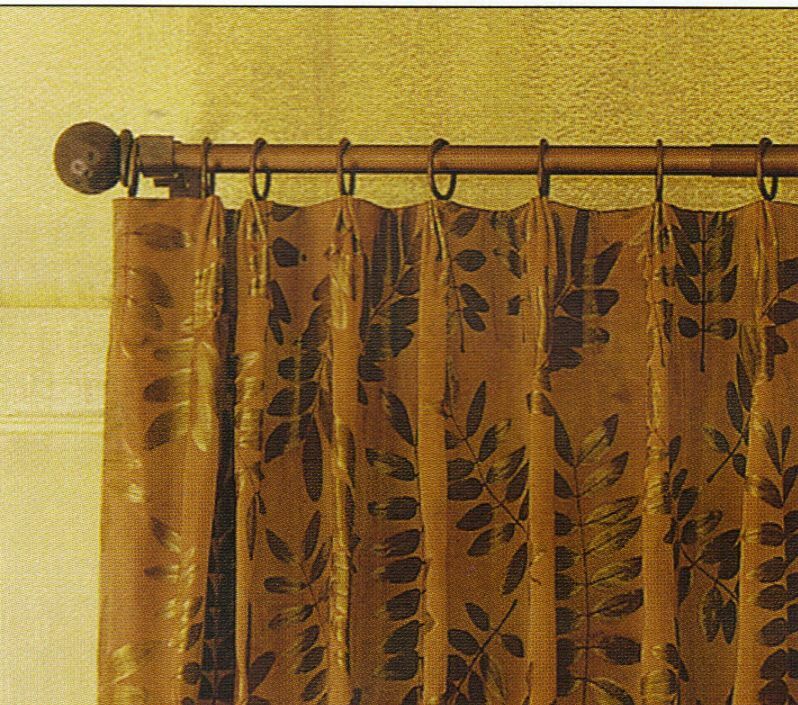 While these may be used with literally any type of drapery hardware, the high fashion styling of today’s decorative rods brings new life and meaning to this timeless favorite. 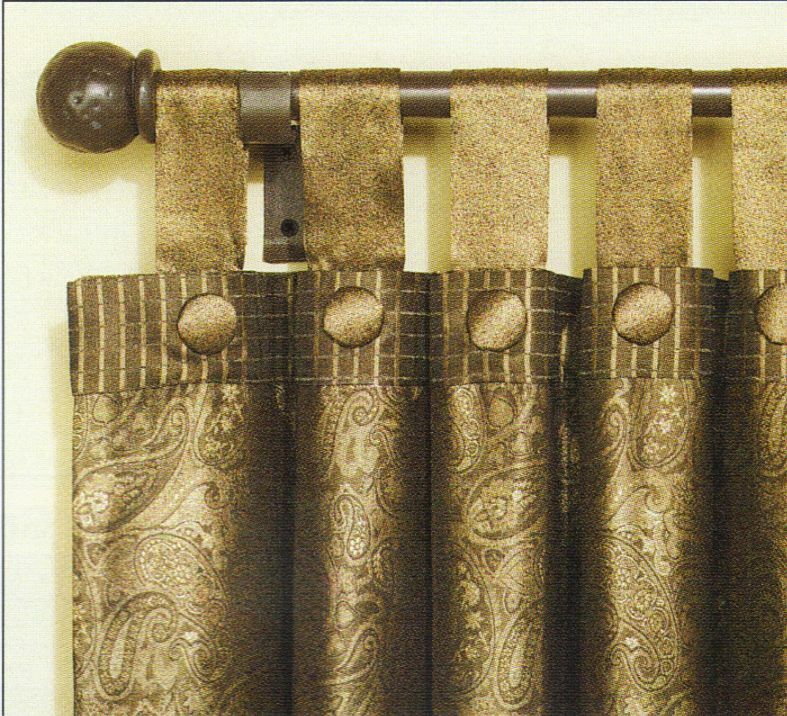 You can create formality, contemporary casual, country, or just plain eclectic depending upon the fabric and hardware you select. 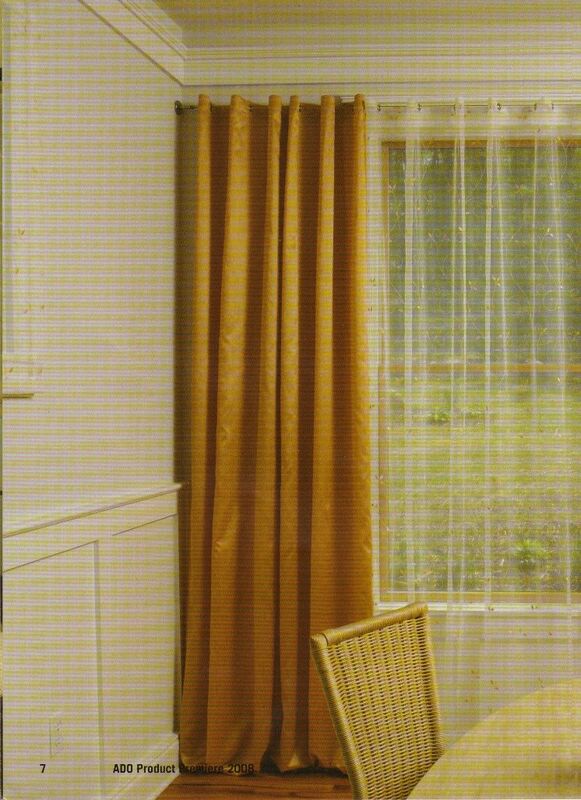 These can be fully functional to provide privacy, or as stationary panels that frame the window and add beauty to the room. 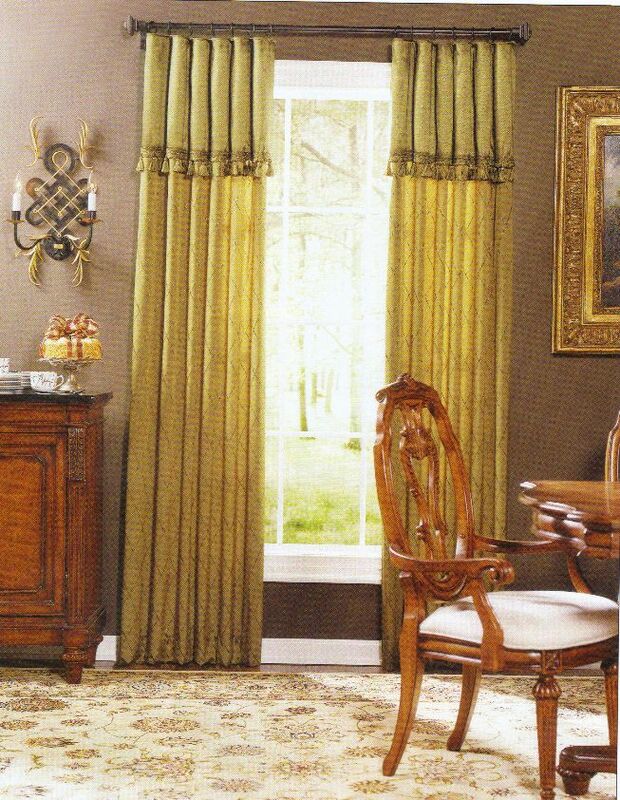 Manor House Drapery Panels This unique flat panel design is inspired by the traditional window treatments found in many English estates and manor houses from the 1600’s. it is as decorative and in style today as it was then. The softening effect of the over-swags draws attention to the treatment. It creates just enough formality. The separate swag attaches to the rings with pin hooks. You can use almost any fabric for the Manor house, including heavier tapestry weaves. It works well with almost any decorative hardware. 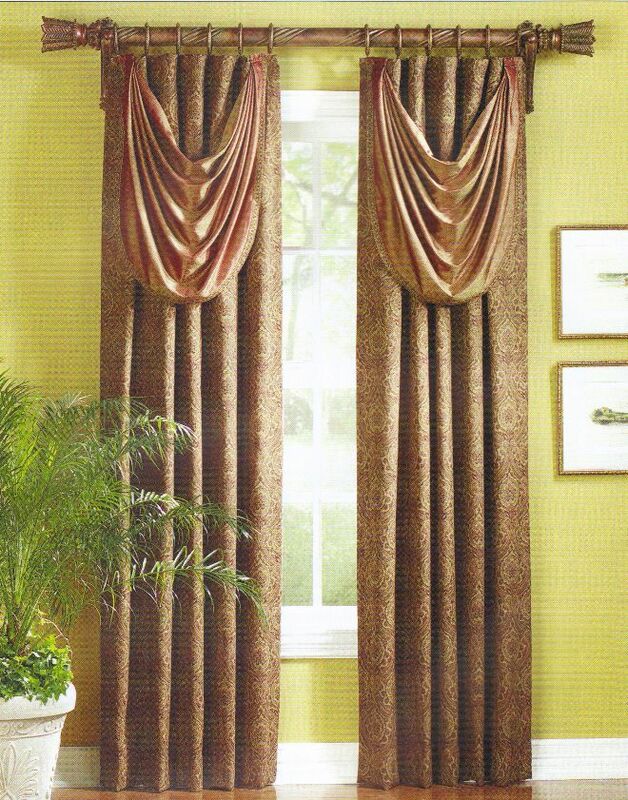 Decorative trim can also be added to the swags. 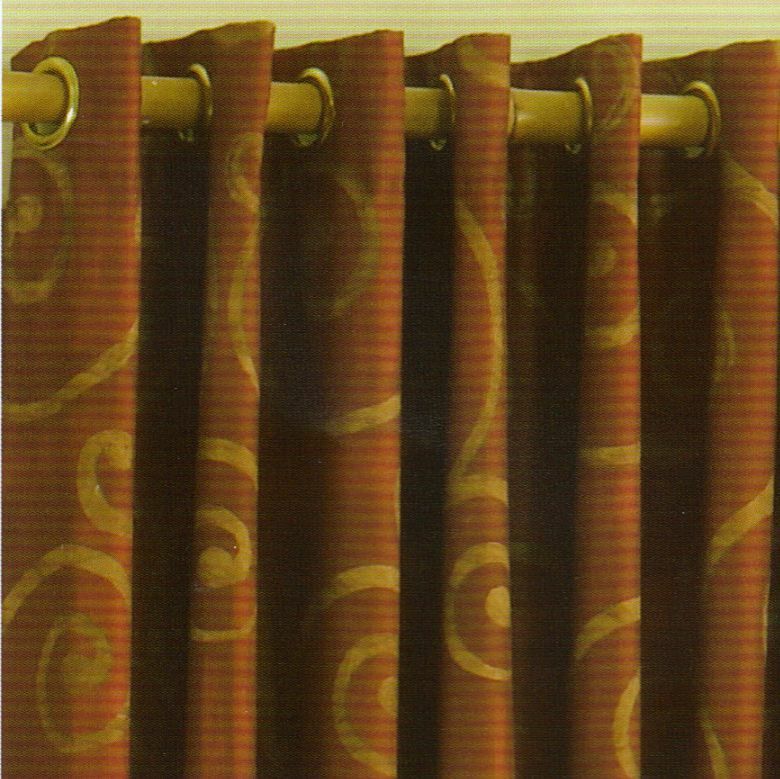 Relaxed Tab Drapery Panels This more contemporary version of a tab top style can be a perfect selection for casual or contemporary rooms. The best fabrics for this treatment are extremely drapable, and practically fall into folds on command. 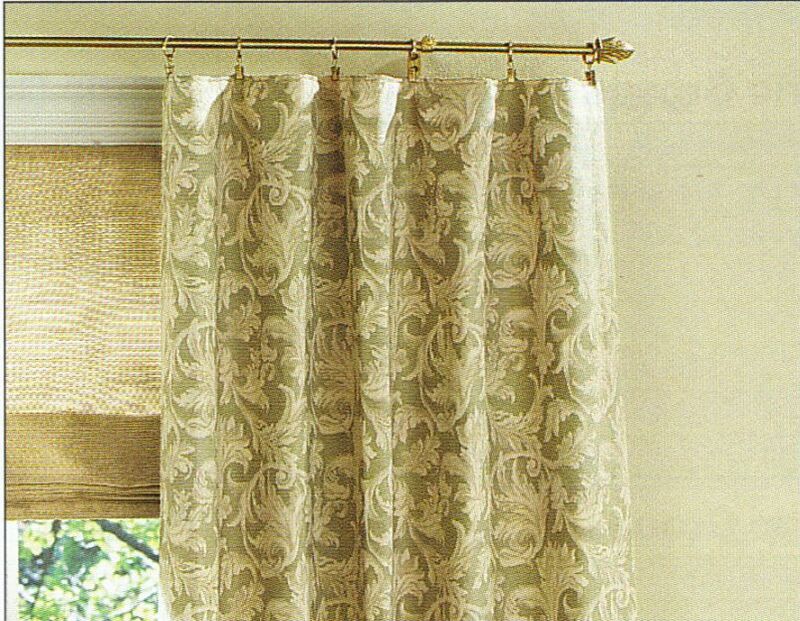 You can use more rigid fabrics if you are leaving the panels in a stationary position. The 2”x4” tabs are spaced farther apart, letting the fabric between droop toward the front. Scarborough Drapery Panels The Scarborough adapts itself to many uses. 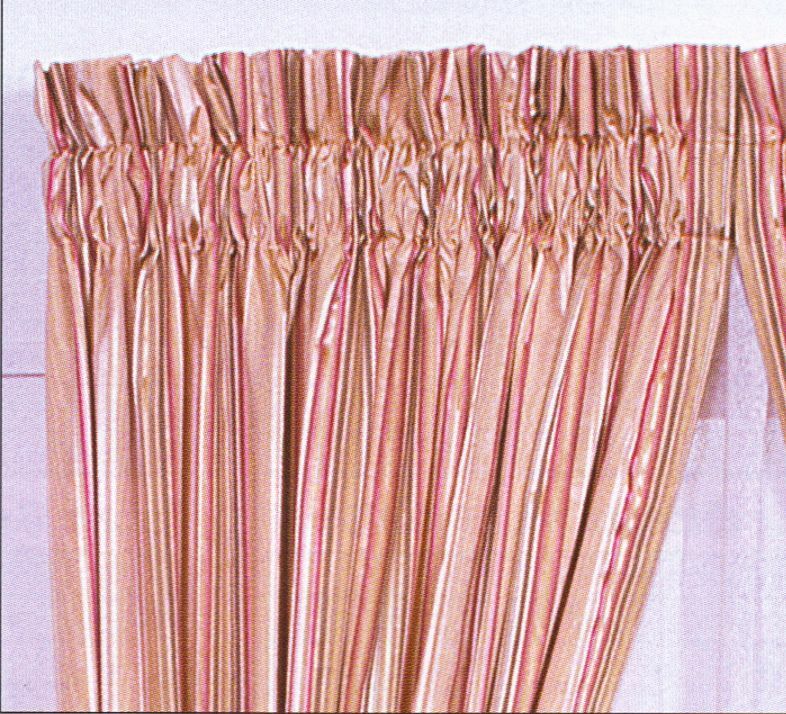 It can be combined with a sheer fabric and no header for use as an under-treatment behind an over-drape. Or, use it as a “stand alone” treatment with any variety of pocket and heading sizes. 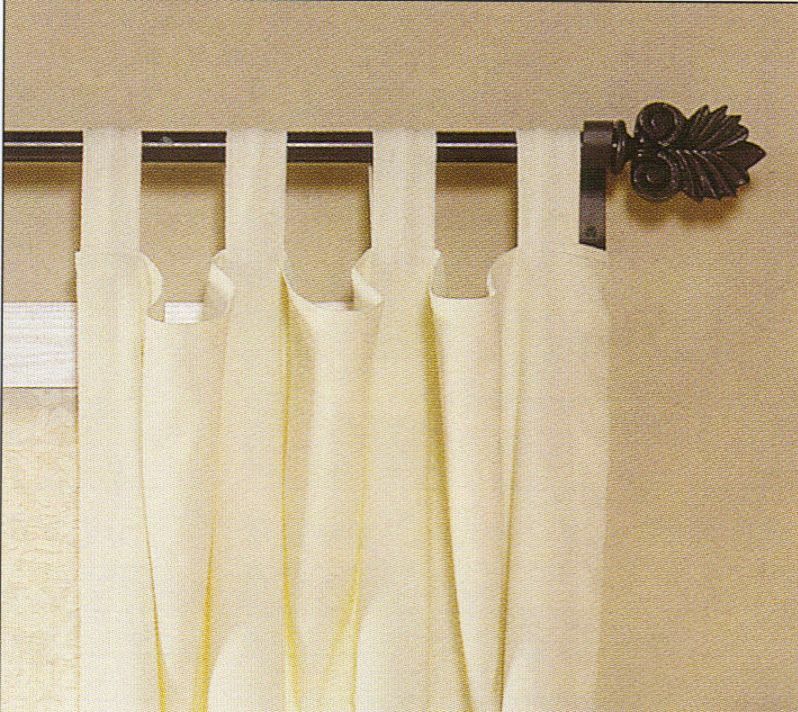 Almost any decorative hardware will work with Scarborough panels. 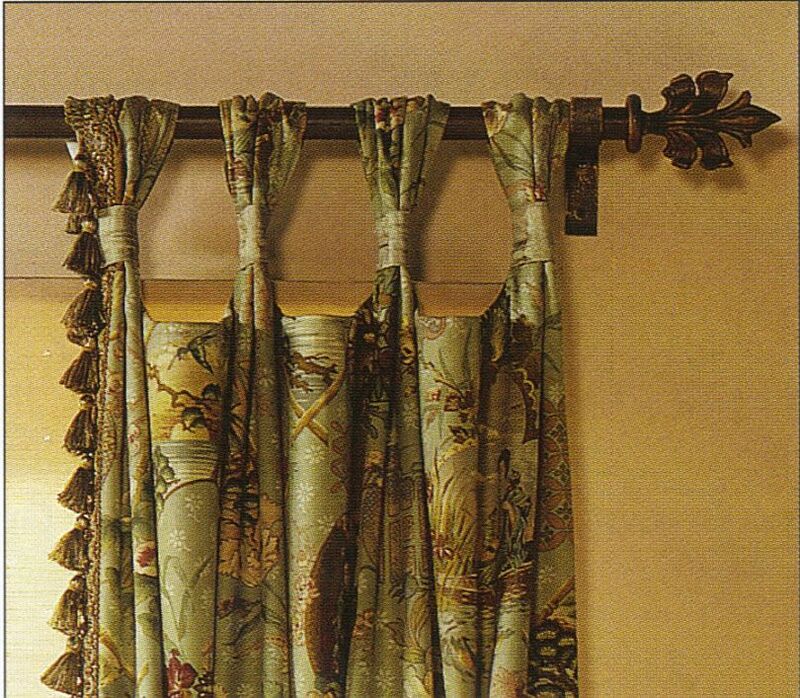 Match the rod to the décor of the room and the fabric selection. Tuxedo Tab Top Drapery Panels Tuxedo Tab Top Drapery Panels with 2" x 4" tabs have been a mainstay of the decorative panel styles for generations. The casual look allows you to perfectly dress a window without being too heavy or formal. This style is an all-time favorite for decorative hardware. Vienna Drapery Panels The Vienna panels feature a sculpted 4” tab appearance with 1” belts of fabric at the base. This creates a tucked effect. The top is sculpted to accent the soft curves of the heading. The Vienna is a stationary side panel. The heading will accept up to a 1 3/8” diameter rod. 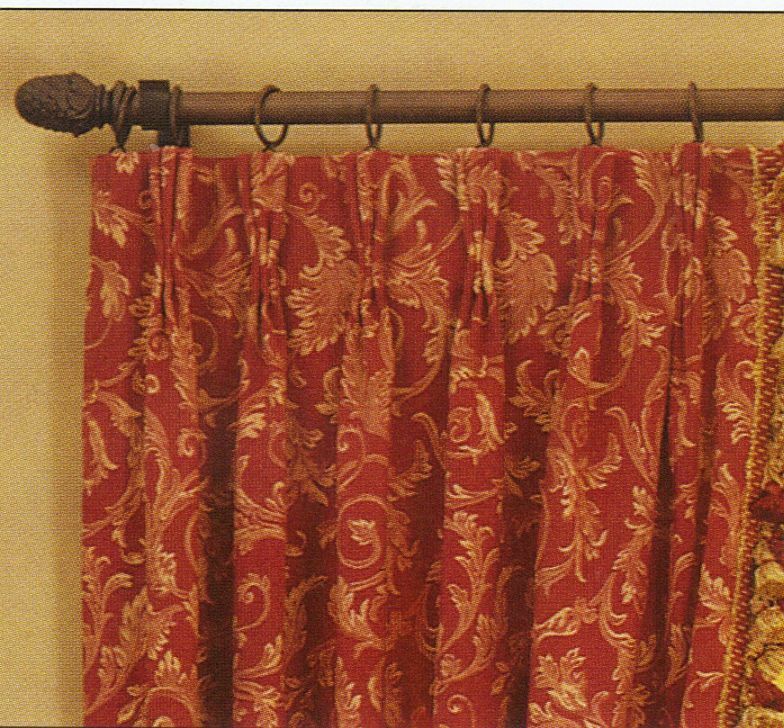 Wellington Drapery Panels Wellington panels are versatile in that they can fit almost anywhere in almost any fabric. 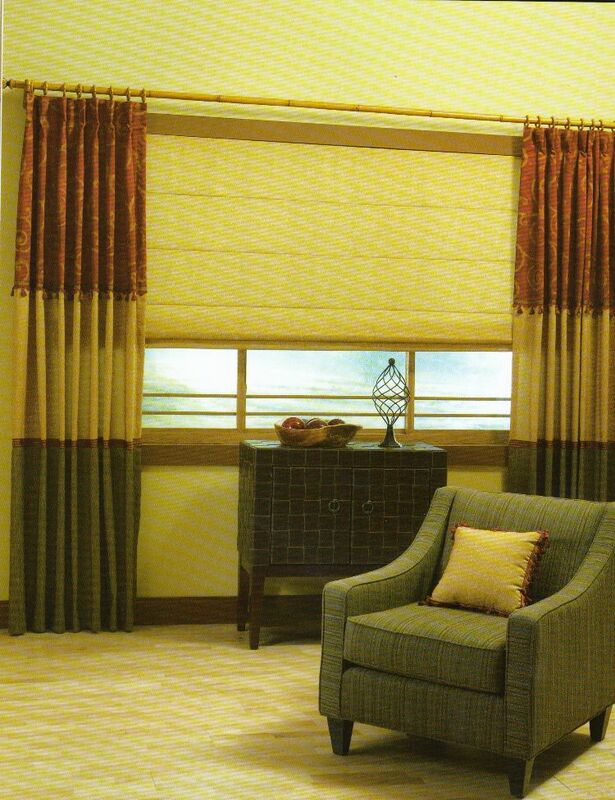 These easy-to-live-with flat panels work well with heavier weight fabrics. Since there are no pleats, larger scale patterns show very well. Picture this style in a crisp contemporary setting with an exciting print and some dramatic hardware. Or, imagine an Old World Tapestry in faded colors with larger rings and an antiqued rod. Wellington panels can be fully functional, coming together when privacy is required. Simply draw them to the center of the rod. 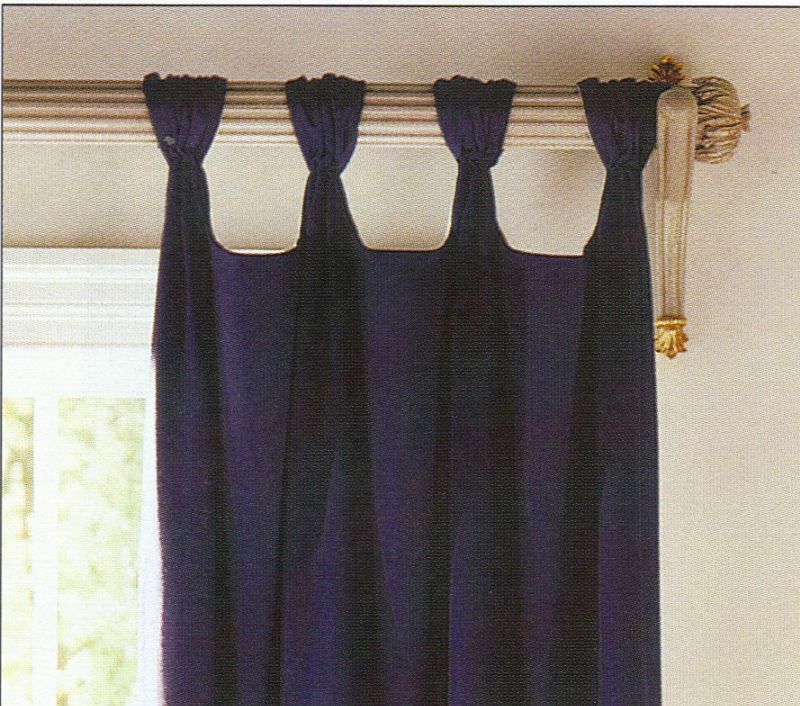 European Pleat Drapery Panels European Pleat panels have a three-fold pleat that is sewn at the top. 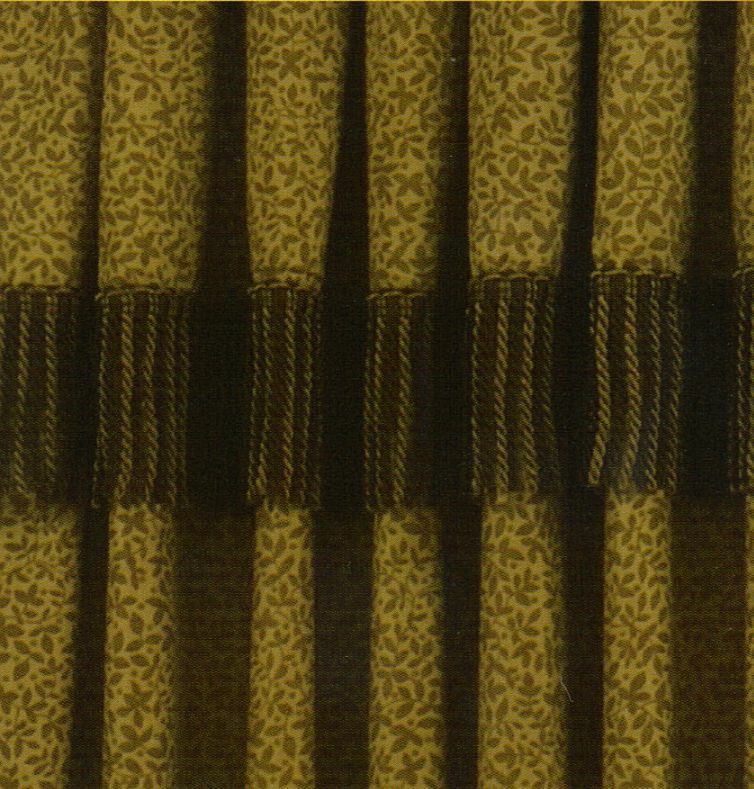 This clean, tailored inverted pleat opens toward the bottom (See close-up image). 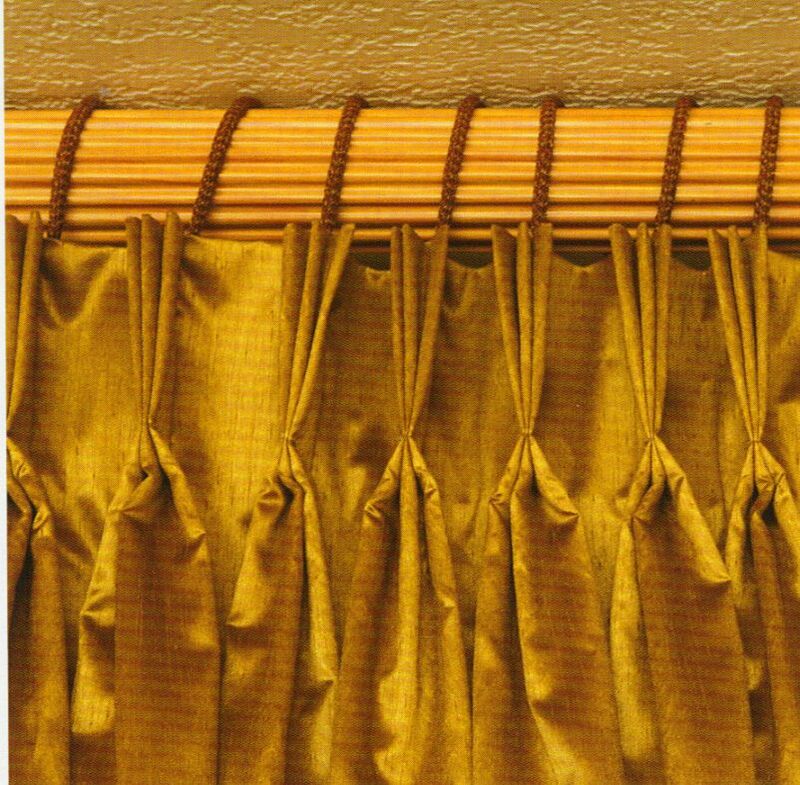 Use the European Pleat with decorative rods and rings for a highly decorative alternative to traditional traverse draperies.